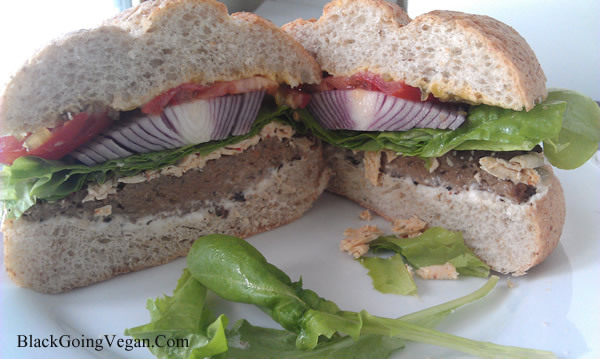 You may not know this, but I’ve been working on coming up with a fabulous vegan hamburger recipe made out of seitan for awhile now. I’ve made at least a dozen variations over the past few months with different additions, different amounts of vital wheat gluten, and different spices. The challenge I had was getting all three of the things I was looking for in one recipe – the right taste, the right texture, and the right look. Usually the vegan hamburger recipe was missing one or more of those vital components, so straight into the garbage disposal it went. Luckily, vital wheat gluten isn’t that expensive or I would be in serious trouble. But after many tries and failures, I think I finally hit the jackpot! Not saying this is vegan hamburger recipe is perfect by any means, because I do plan to continue fiddling with it as time goes on. However, this met my expectations fully! 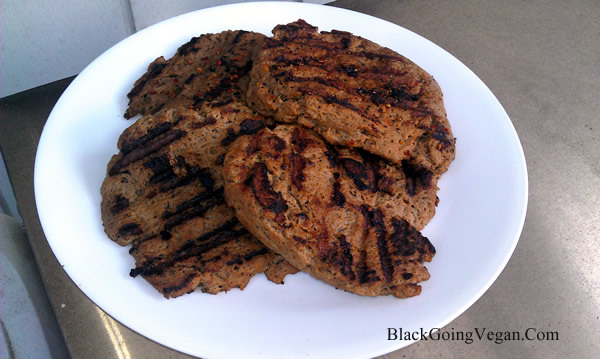 What we have here is a firm textured but moist, flavorful burger that is tender, but won’t fall apart if you put it on a grill. 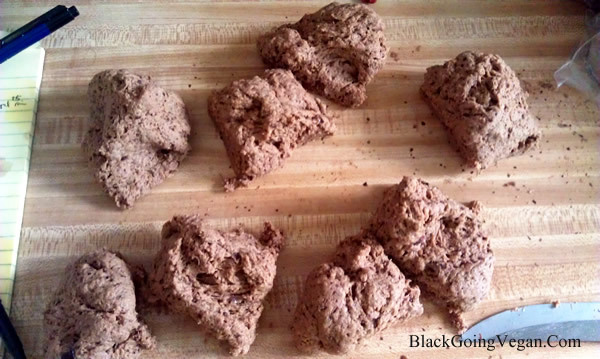 Some folks were giving me the serious side-eye, concerned about the rather shocking similarity it has to ground turkey – they claimed they had to “do a double-take” to make sure it wasn’t meat! 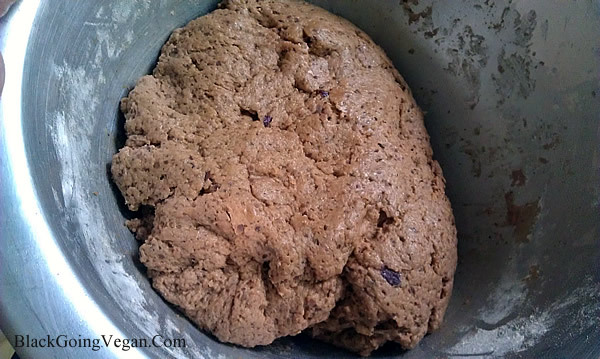 First you make your seitan dough. Use a food processor or blender to mix all the wet ingredients, then add them to the bowl with the dry stuff. Stir well then dig in there with your fingers to do a more complete job. Add a bit more flour, a tablespoon at a time, if it feels TOO wet. We want it somewhat loose, but not breaking apart in your hand. Knead the dough 2-3 minutes, then let it rest in the bowl for 20-30 minutes. 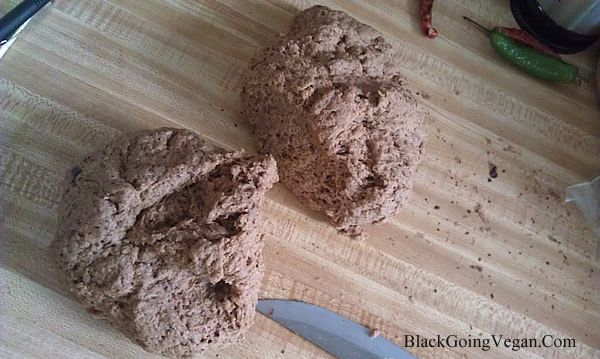 Turn dough out onto counter or cutting board, and roll it into an even cylinder. Cut it in half, then cut each half in half again, then each of those in half once more. 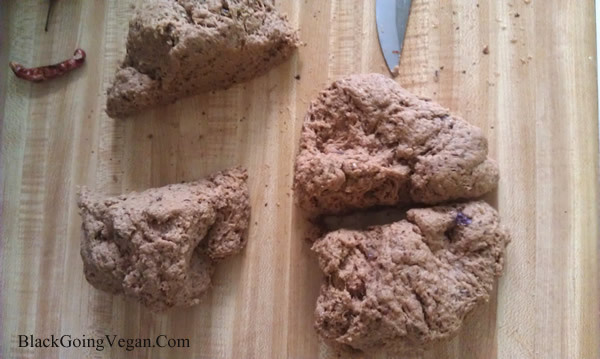 You’ll end up with eight blobs of seitan. Form each ball into a burger that will fit your buns. If you make smaller burgers or sliders you can cut the dough even smaller into half again or even thirds, but I had extra large buns so I just made eight patties. If you have one of those burger molds, use it. I don’t so mine look… well, kinda rough. When all patted out, slide them into the simmering seasoning broth. Let it lightly boil for about 5-6 minutes, then reduce the heat to a low simmer and cook for 45 minutes. Let seitan cool in cooking broth, then remove and refrigerate overnight which helps it get a bit firmer and more “meaty” in texture. Remove from fridge and heat up your grill. Pop those puppies on about 4-5 minutes each side with the grill cover on, to really firm them, give them a bit of an extra smoky taste, and develop a nice crispy outer coating. I sprinkled mine with some Montreal Steak Seasoning and Hamburger Seasoning on a couple of others just to see how it tasted. Really good! Added the usual burger toppings, including lettuce fresh picked from my little garden just this morning, and some Daiya pepper jack cheeze shreds. Check back every few weeks to see what modifications I may make to this recipe, and feel free to make it your own and let me know what you did. I’ve been struggling along with this recipe by myself, but maybe this is a “five heads are better than one!” situation. Ya know? We enjoy seeing your comments and photos, so be sure to come by and share! 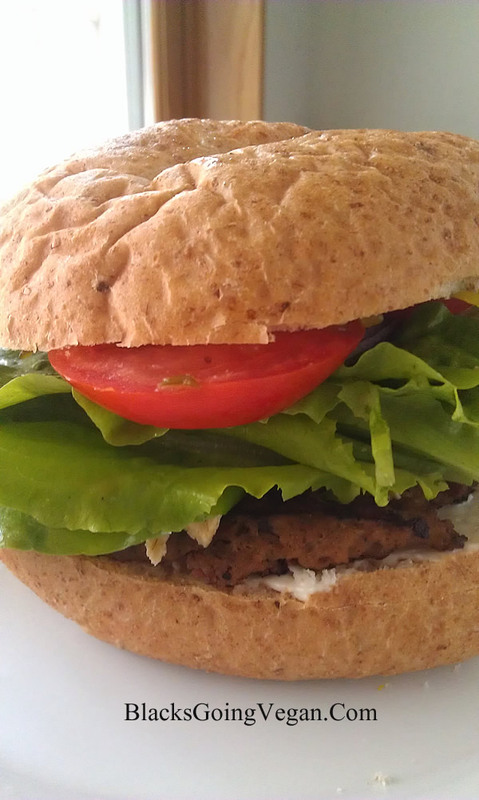 After much experimentation, finally came up with a vegan hamburger recipe that meets my expectations for a replacement burger in taste, texture and look. Delicious on the grill, cloaked in a whole wheat bun with all the fixins and a side of sweet potato fries. Bring a couple with you to upcoming summer barbecues and parties! Place bouillon cube and dried mushrooms in a large cup with hot water. Set aside. Place 2 Tablespoon olive oil in large non-stick pan and add sliced red onion. Carmelize by cooking over low heat about 20 minutes until lightly brown and soft. Add chopped garlic and cook another 5 minutes, stirring frequently to prevent burning. Set aside to cool slightly. Put dry ingredients into a large bowl. Into a food processor or blender put all of the wet blend ingredients, along with the mushrooms and bouillon water, and the onions and garlic. Blend until smooth, about 1 minute. Pour wet ingredients into dry bowl and mix with spoon, then with your hands. When no dry mix is left, turn dough out onto counter and knead for 3 minutes. Return dough to bowl and let rest for 20 minutes. While dough rests, prepare your simmering broth and let it come to a boil over medium heat. 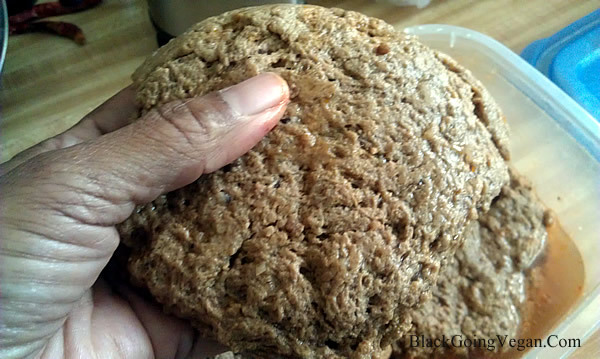 Divide dough into 8 or more even sections, and pat out into burger patties. 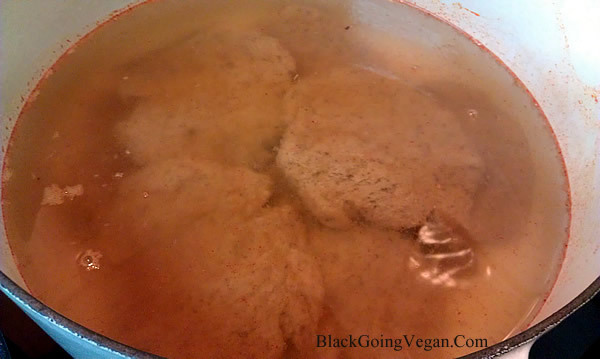 Add your seitan patties to broth and let cook about 5-6 minutes, then lower heat to a simmer. 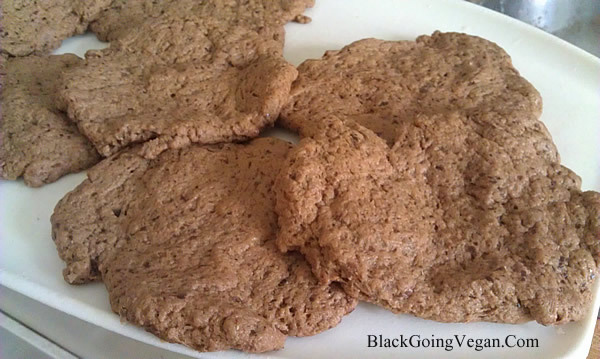 Cover pot and let seitan patties cook for 50 minutes. Remove pot from heat and allow seitan to cool in the broth with top on. 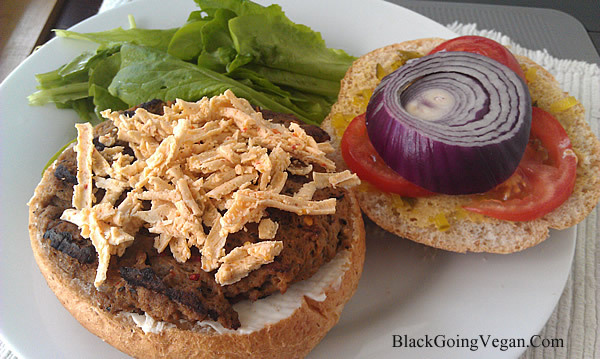 Remove from pot when cool and refrigerate in plastic container overnight to firm and develop it's burger texture. When ready to serve the next day, spray grill lightly with oil and add burger patties. Cook about 5 minutes with grill covered, until patties develop nice grill marks and a slightly crispy outer coating. Flip and repeat on other side. Add cheese one minute before removing from grill if you like it melted. Serve with the usual burger fixings. 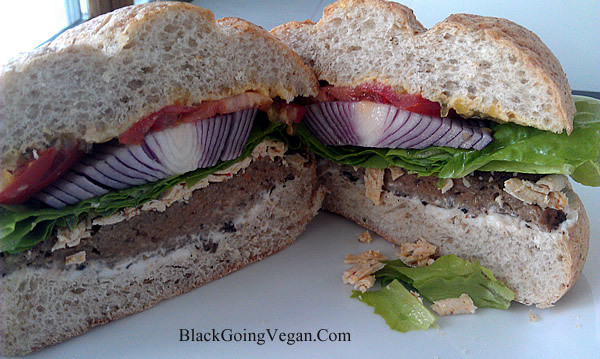 Get exciting new soul food, Cajun/Creole and classic American recipes done vegan! 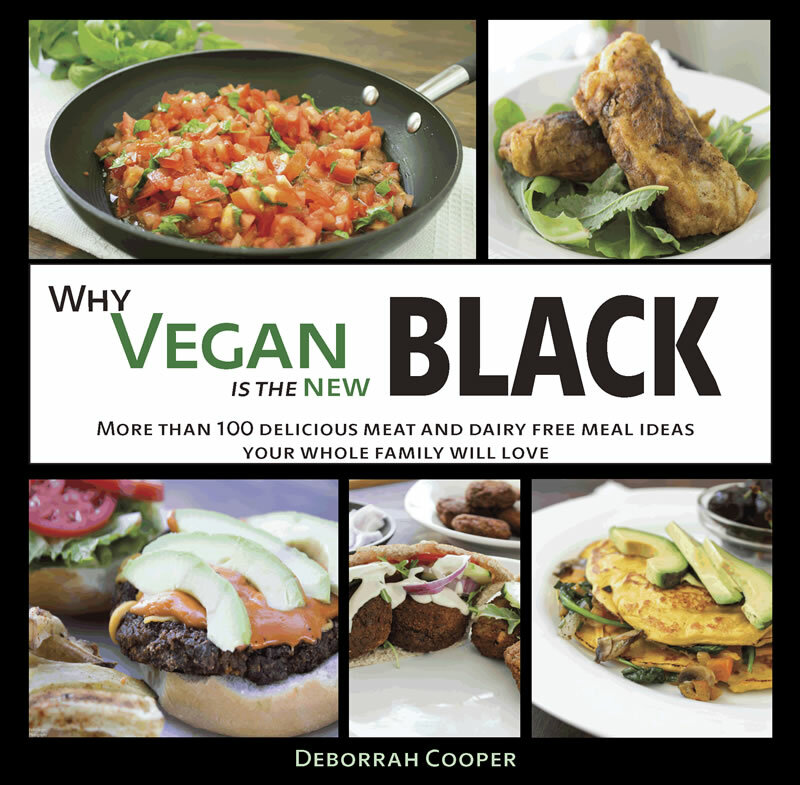 Check out WHY VEGAN IS THE NEW BLACK: More than 100 Meat and Dairy Free Meal Ideas Your Whole Family Will Love.